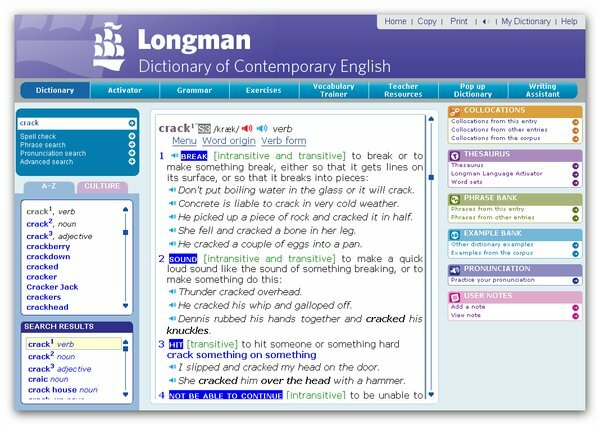 Longman Dictionary of Contemporary English 5th Edition has new user-friendly features to help advanced learners become fluent in English, including cutting edge software to build vocabulary faster. This edition comes with a new innovative DVD that features the full contents of the dictionary plus British and American pronunciations of headwords and example sentences, interactive exercises and much more. Simply no other learners' dictionary compares. 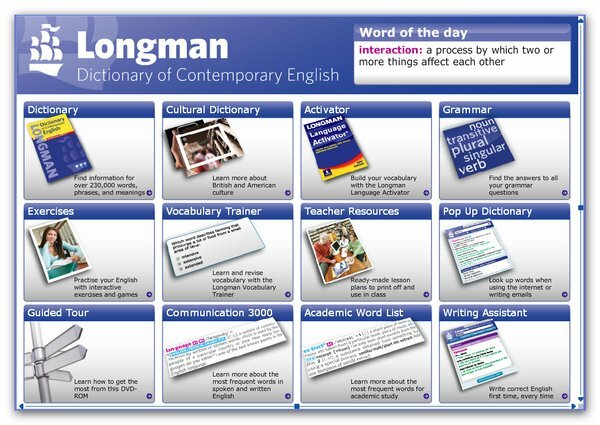 TheLongman Dictionary of Contemporary Englishprovides the ultimate active learning tool – and is now available in a format to suit everyone. Whether in print, on DVD-ROM, online or via a PDA or mobile phone, you can access the best language support whenever and wherever you want – simply no other learners’ dictionary compares. The Longman Dictionary of Contempory English (new edition) the most comprehensive dictionary and DVD-ROM ever. 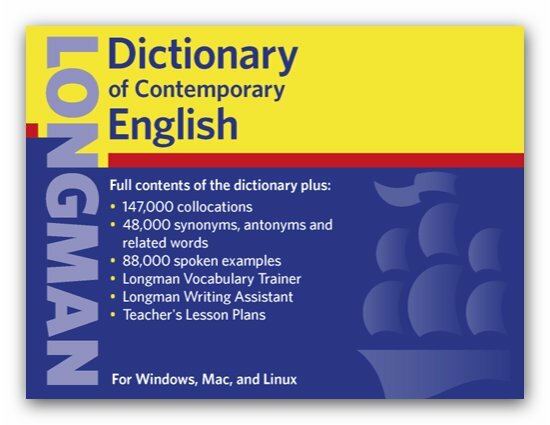 Includes: *230,000 words, phrases and meanings more than any other advanced learner's dictionary *165,000 examples based on real, natural English from the Longman Corpus Network + an additional 1 million corpus examples on the DVD-ROM. *Clear definitions written using only 2,000 common words. *Over 18,000 synonyms, antonyms and related words + an additional 30,000 on the DVD-ROM. *Over 65,000 collocations + an additional 82,000 on the DVD-ROM. *The top 3,000 most frequent words in spoken and written English are highlighted to show which are the most important to know. *NEW Integrated Collocations Dictionary. Over 65,000 collocations will improve students' fluency. *NEW Integrated Thesaurus. Over 18,000 synonyms, antonyms and related words will improve vocabulary range. *NEW Register Notes focus on the differences between spoken and written English. *Academic Word List highlighted. *Grammar and warning notes ensure that students avoid common errors. *NEW text design ensures students can find information fast. PLUS...The Longman Vocabulary Trainer tests your knowledge of a word its meaning, grammar, collocation and usage then remembers how well you know that word. The word is then recycled and retested at different intervals so the word is never forgotten! You can download the Longman Vocabulary Trainer to your mobile phone to make the most of learning on the go!. 165,000 examples based on real, natural English from the Longman Corpus Network + an additional 1 million corpus examples on the DVD-ROM. Over 18,000 synonyms, antonyms and related words + an additional 30,000 on the DVD-ROM. Over 65,000 collocations + an additional 82,000 on the DVD-ROM. The top 3,000 most frequent words in spoken and written English are highlighted to show which are the most important to know. NEW Integrated Collocations Dictionary. Over 65,000 collocations will improve students’ fluency. NEW Integrated Thesaurus. Over 18,000 synonyms, antonyms and related words will improve vocabulary range. NEW Register Notes focus on the differences between spoken and written English. TheLongman Vocabulary Trainertests your knowledge of a word – its meaning, grammar, collocation and usage – then remembers how well you know that word. The word is then recycled and retested at different intervals so the word is never forgotten! 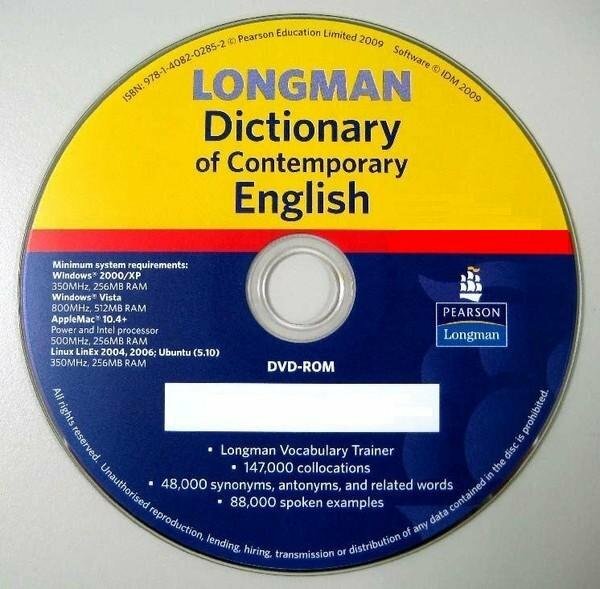 The Longman Dictionary of Contempory English (new edition) the most comprehensive dictionary and DVD-ROM ever. Includes: *230,000 words, phrases and meanings more than any other advanced learner's dictionary *165,000 examples based on real, natural English from the Longman Corpus Network + an additional 1 million corpus examples on the DVD-ROM. *Clear definitions written using only 2,000 common words. *Over 18,000 synonyms, antonyms and related words + an additional 30,000 on the DVD-ROM. *Over 65,000 collocations + an additional 82,000 on the DVD-ROM. *The top 3,000 most frequent words in spoken and written English are highlighted to show which are the most important to know. *NEW Integrated Collocations Dictionary. Over 65,000 collocations will improve students' fluency. *NEW Integrated Thesaurus. Over 18,000 synonyms, antonyms and related words will improve vocabulary range. *NEW Register Notes focus on the differences between spoken and written English. *Academic Word List highlighted. *Grammar and warning notes ensure that students avoid common errors. *NEW text design ensures students can find information fast. PLUS...The Longman Vocabulary Trainer tests your knowledge of a word its meaning, grammar, collocation and usage then remembers how well you know that word. The word is then recycled and retested at different intervals so the word is never forgotten! You can download the Longman Vocabulary Trainer to your mobile phone to make the most of learning on the go! 打开画面，十二个功能如棋盘状展开。Guided Tour 有 58段动画介绍，我强烈建议使用者先全部看过。因为整套软件的功能大致都有不错的解说。这个开启画面，每次启动软件都要在此停留，还真有点累赘。点选左上 角 Dictionary 即可进入辞典.